There are a couple of things I am very spoiled with. First, I grew up with a mom that is an amazing cook. The other is because of who she was. I got to eat homemade potato salad far more than I had to eat that stuff in the deli of your local grocery store. 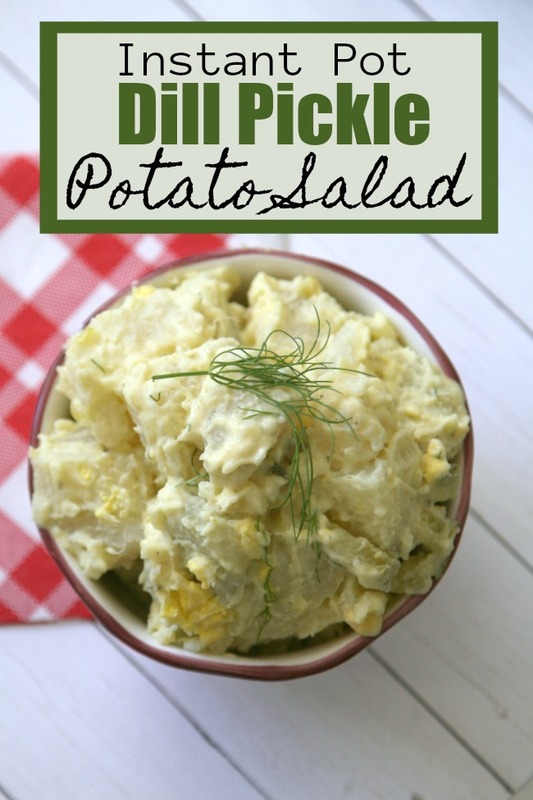 Because of this, I am kind of a potato salad snob and started making my own recipe in my early 20’s. 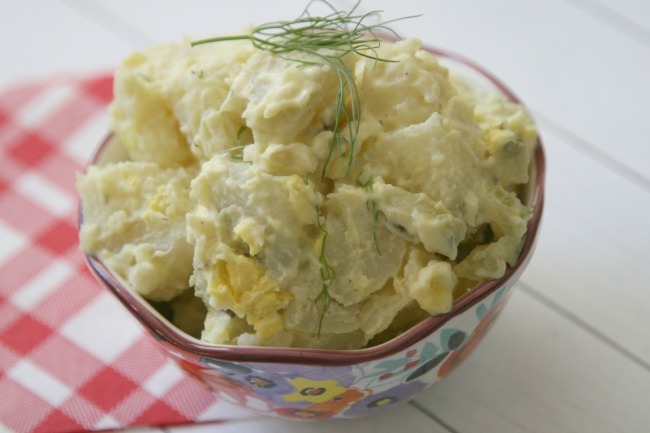 I have spent years perfecting it and this is my special dill pickle potato salad recipe I want to share with you, so you can taste the joy of homemade potato salad with a dill zip to it. Like many of my recipes, I use a special ‘secret’ ingredient that you may have never heard of. This time, it’s something I grew up with that I honestly didn’t know wasn’t in everyone’s fridge growing up- Durkee’s Famous Sauce. (And no, they didn’t sponsor this. I just love this stuff!) Let me tell you, I have this special sauce on every sandwich and on my table at thanksgiving because it tastes amazing on turkey. It has been a big part of my childhood. It has a zippy vinegar base that lends itself nicely to the dill in this recipe that I haven’t found a replacement for. You may not be able to find it where you are, so here’s a way to order Durkee’s Famous Sauce on Amazon. First, let’s get those potatoes prepared. If doing it in an Instant Pot, the best way I have found is to use the beans setting for 16 minutes. After experimenting, this is the perfect time as to not cause them to be too soft. I am using a 6 qt Instant pot, by the way, so that is what measurement I use. You don’t have to peel your potatoes, either! I find that the skins just pull right off when they are cooked! Take your potatoes, rinse them and cut each in half. They don’t have to be perfect cuts, either, because you will be cutting them up later. Place them in your pot, add 2 1/2 cups water and set your Instant Pot. While those cook, hard boil your eggs. They should be just about done when your timer goes off, so this is perfectly timed! I place my eggs in cold water and then on the stove. I set them to boil and they only have to boil for 5 minutes and they are done. Remove them from the hot water and place them in cold water to cool. This is a perfect time to also mix up the sauce for your salad. 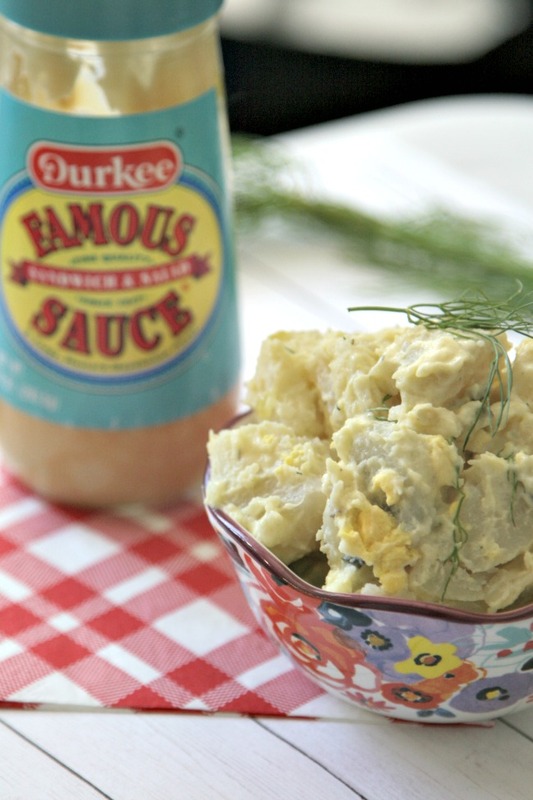 It’s as simple as adding in your Durkee’s Famous Sauce, Mayonnaise, Yellow Mustard, Lemon juice, salt, pepper and sugar. Mix them well and add in your dill and bread and butter pickles. I use two different kinds to off-set the sourness of the Durkees’s and Lemon Juice. Finally, add in your dill weed. From here, you can adjust your sauce to your taste. I like to sometimes play with adding more of an ingredient to get the exact flavor I am looking for. When your potatoes are ready,release the steam and carefully remove them from the pot. Place them in a separate bowl and try to remove as many skins as you can. They will generally just peel off, but use care not to burn yourself. Place your potatoes in the fridge, uncovered, to cool. Now is a great time to crack and peel your eggs. When they are all done, cut them into slices and place in the fridge. I find that it takes about 45 minutes to an hour for your potatoes to be cool enough to use for the salad, so sit and relax! Now, check your tators. They should be cool by now so you can cut them up into bite sized chunks. Pour your sauce over and add your eggs and green onions. With a rubber spatula, GENTLY mix all your ingredients together. Top with fresh dill sprigs if you desire and enjoy! Save your money! Dry your own herbs!